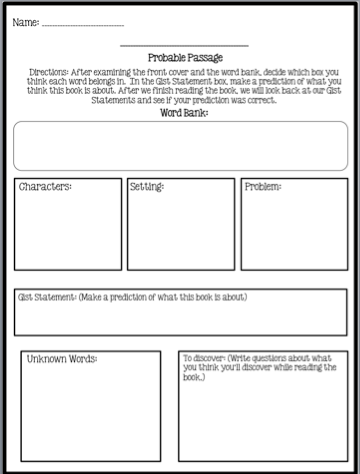 Pinkadots Elementary : How do you introduce class novels? New Freebie by special request! How do you introduce class novels? New Freebie by special request! Happy Tuesday! We are in the middle of reading our Spring core novel, Riding Freedom. It is seriously an amazing novel and I think it makes it even better that it isn't super popular, so my students have never heard of it, until I pull it out of the closet. There is nothing worse than being excited to start a novel, showing it to the class, and hearing..."Ohhhhh, I've read that last year, I hate when blah blah blah blah happens." That makes me want to crawl into a hole. I can always guarantee that won't happen with this book. We have a class set of books, so everyone uses their own novel. This makes it very convenient when it comes time to answer text dependent questions. Anyways, one way that Robyn and I both like to introduce this book is through a "Probable Passage". What is that? Well, it is a fun little "think and guess" activity that generates student curiosity about the novel. You start the activity by finding random vocabulary words throughout the book and writing them in the word bank. Everyone uses the same set of words. (I normally have students complete this in partnerships because it generates great conversations.) Students discuss what words will most likely be a character, setting, problem, something that might be discovered, or if they are REALLY stuck, they can put the word in the unknown word box. In the center they fill out a "Gist Statement" - a simple statement or prediction using the words from all the other boxes about what you THINK will happen in the book. The reason why this is so fun is because never, have I EVER, seen a student get relatively close to predicting the book. It makes the book extra fun because while we are reading and come across a word that was on this worksheet the whole class has a "Ah hah" moment and you seriously hear...."Ohhhhhhh!" and then laughter. This simple activity is sure to get the students engaged in their reading, conversations, and motivate them to want to learn more. Lucky for you, I've made an editable document in Power Point. Simply click on the picture above to download the worksheet from my Google Docs. It should open in Power Point. Create a text box over the "title" and "word bank" and fill them in. Print, copy, and let the fun begin! Let me know if you try it out and how it works! I'd love to hear other ways you get students interested in reading novels! What a great way to introduce a novel! I could see using this with my higher learners!! Thank you so much for sharing. Great idea for introducing a new book! I will give this a try next 9 weeks when we read "Catching Fire". Thanks!! We did this to introduce a short story earlier in the year, and it was comical to read their predictions. I love this activity! What a great idea! I can't wait to use it next year!